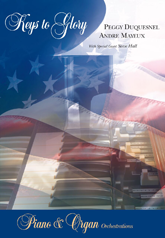 Patriotic anthems, folk songs and hymns "Keys to Glory" released in the fall of 2018 to honor the 100th Anniversary of Veterans Day! This "Keys to Glory" Nature Video is a colorful kaleidoscope of scenic beauty of our majestic country...a journey from American monuments such as the Statue of Liberty and Mount Rushmore to vibrant oceans, flowing waterfalls, colorful gardens, snow-capped mountains, fields and farms showing the glory of America and God's creation. 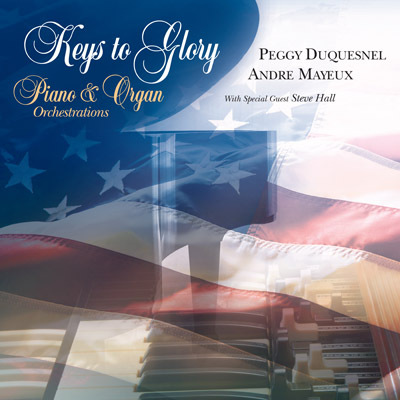 2019 Discounts on CDs, DVDs, Sheet Music and Downloads! CDs: Buy any 3 CDs get one free! 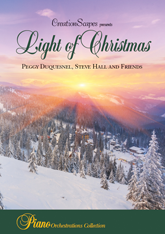 This "Light of Christmas" nature video combines some of our memorable holiday music arrangements with magnificent outdoor scenery. 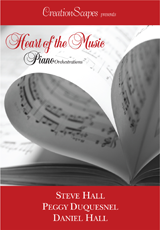 The musical selections include many of my personal favorites as well as popular recordings from the late Steve Hall. Gary Hanson of CreationScapes provides the spectacular video footage that enhances the music. I hope this nature video brings joy and light to your holidays! 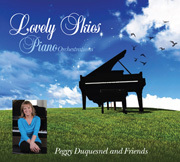 These uplifting popular and original songs feature Peggy's easy listening and contemporary piano arrangements with 20 other "world-class" musicians. Enjoy! Purchase or download the "Lovely Skies" album and receive vocal versions of five of the album songs as a gift! "In the Garden" presents 15 hymns, classics and originals featuring acclaimed pianist / composer / arranger Peggy Duquesnel along with colorful orchestrations and woodwind playing by award-winning Billy Martin. It also includes two popular hymn performances by the late Steve Hall. The music provides an enjoyable, peaceful experience! 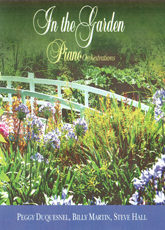 The “In The Garden” nature video features “Piano Orchestrations” by Peggy Duquesnel, Billy Martin and Steve Hall.